Ido Zoldan, 29, of the settlement of Shavei Shomron was murdered Monday in a late night shooting attack near the Palestinian village of Funduk in the area of the Kedumim settlement in the northern West Bank. 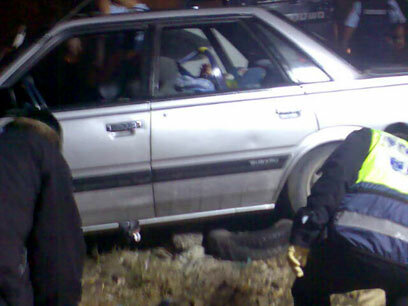 The terrorists opened fire at the Israeli from a passing car at around 11:30 pm. Magen David Adom paramedics who were called to the site attempted to revive the man, but pronounced him dead a short while later. Zoldan was survived by his wife Tehila and his two small children, three-year-old Aharon and one-year-old Rachel. His family is well-known in Kedumim. His father, Nahman Zoldan, is one of the biggest contractors in the West Bank's Jewish settlements. Ido Zoldan was evacuated from the community of Homesh during the 2005 disengagement from Gaza. Since then he was active in the "Homesh First" group and was among those who went up to Homesh two years after the evacuation. In an attempt to locate the terrorists, the IDF has begun combing the area. Shortly after the attack, the al-Aqsa Martyrs Brigades, Fatah's military wing, announced that it was assuming responsibility for event. A spokesman for the organization said that the terror attack was "an act of protest against the Annapolis conference and a response to Israeli crimes". The Yesha council responded to news of the attack by saying that "the murderous shooting attack is the unfortunate result of the wholesale release of terrorists. "The Yesha council calls upon the government to get a hold of itself, to strengthen its defense of the country's citizens, and to cease making gestures that award terror." During a Labor party meeting earlier in the day, Defense Minister Ehud Barak warned that as the Annapolis conference approaches, Israel must ready itself for all scenarios, whether the emerging danger is from Hamas or Hizbullah. As the peace conference gets closer, the Defense Ministry has in its possession five specific warnings on attempts to carry out terrorist attacks, in addition to some dozens of general warnings. Israeli police are currently discussing and assessing the situation and will soon decide whether to raise the general alert level before Annapolis. See all talkbacks "Israeli killed in West Bank terror attack"